What's the difference between a static IP address and a DHCP reservation? The end result is the same - your Mac will be assigned a static IP address when it connects to the AirPort network. But DHCP reservations are easier to set up. Since all configuration is performed in the AirPort Utility application, you can quickly and easily assign static IP addresses to multiple computers and devices without reconfiguring them individually. 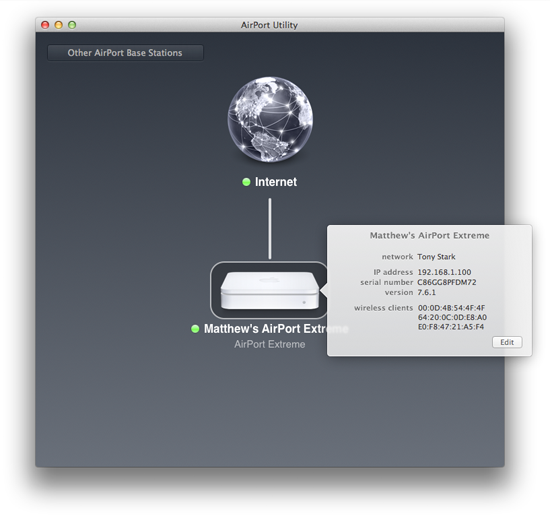 You'll use the AirPort Utility application to assign a static IP address to your Mac's MAC address. 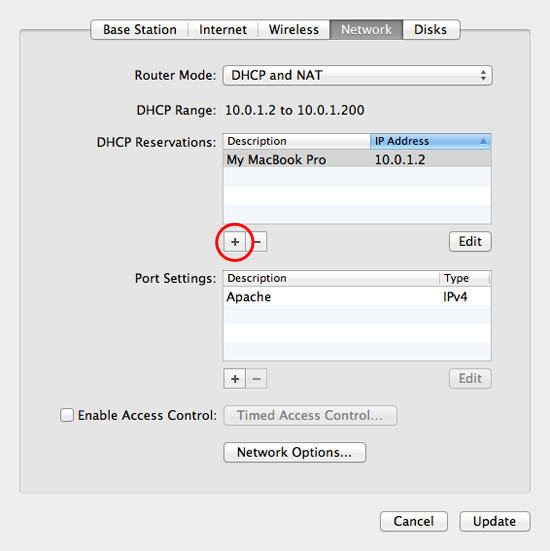 After you create a DHCP reservation, the AirPort will monitor the network for your Mac. When it detects that your Mac has connected to the network, the AirPort assigns the static IP address you specified in the AirPort Utility application. Since the AirPort base station takes care of everything, you don't have to worry about setting up Network Locations in OS X. Find your Mac's MAC address for the Wi-Fi network interface. See How to Find Your Mac's MAC Address for instructions. Click the + button under the DHCP Reservations field. The window shown below appears. Enter a descriptive name for your Mac in the Description field. From the Reserve Address By menu, select MAC Address. Enter your Mac's MAC address in the MAC Address field. Enter the static IP address you want to assign to your computer. For more information, see step 9 in How to Set a Static IP Address in Mac OS X. Now your Mac will be assigned the static IP address every time you connect to the wireless network. You can repeat this process to assign static IP addresses to all of the computers and devices connected to your network.